Electric currents drive all our electronic devices. The emerging field of spintronics looks to replace electric currents with what are known as spin currents. Researchers from the University of Tokyo have made a breakthrough in this area. 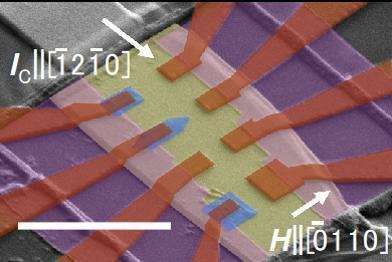 Their discovery of the magnetic spin Hall effect could lead to low-power, high-speed and high-capacity devices. They have created sample devices which can further research into potential applications. So what is spintronics and why should we be excited? Currently, power efficiency of electrical and electronic devices is a limiting factor in technological development. The problem lies in the nature of electric currents, the flow of charge in the form of electrons. As electrons traverse a circuit they lose some energy as waste heat. Spintronics improves upon the situation – instead of movement it exploits another property of electrons to transfer information, their angular momentum or “spin”. To demonstrate this phenomenon researchers created a new kind of material called a ‘non-collinear antiferromagnet’ – Mn3Sn which is a special kind of magnet. In everyday magnets – or ferromagnets – such as you might find on fridge doors, the spins of the electrons within align in parallel which imbues the material with its magnetic effect. In this antiferromagnet the spins of the electrons line up in triangular arrangements such that no one direction is prevalent and the magnetic effect is effectively suppressed. When a small electric current is fed into Mn3Sn and a magnetic field is applied to it in just the right way, the electrons order themselves according to their spin and electrical current flows. This is the magnetic spin Hall effect, and the process can be reversed with the magnetic inverse spin Hall effect to get an electric current from a spin current. In Mn3Sn alike spins tend to accumulate on the surface of the material, so it’s cut into thin layers to maximize its surface area and thus the capacity of spin current a sample carries. The researchers have already embedded this material into a functional device to serve as a test bed for possible applications and are excited by the prospects. But how do these ideas translate into applications? Devices based on the traditional spin Hall effect already exist in spintronics research but the magnetic spin Hall effect and novel materials used could vastly improve all kinds of technology. Motoi Kimata, Hua Chen, Kouta Kondou, Satoshi Sugimoto, Prasanta K. Muduli, Muhammad Ikhlas, Yasutomo Omori, Takahiro Tomita, Allan. H. MacDonald, Satoru Nakatsuji, Yoshichika Otani. Magnetic and inverse spin Hall effects in a noncollinear antiferromagnet. Nature. This work is partially supported by CREST (No. JPMJCR15Q5), Japan Science and Technology Agency, and Grants-in-Aid for Scientific Research (No. 16H02209, 25707030), and by Grants-in-Aids for Scientific Research on Innovative Areas (15H05882, 15H05883, 26103002) and Program for Advancing Strategic International Networks to Accelerate the Circulation of Talented Researchers (Grant No. R2604) from the Japanese Society for the Promotion of Science. H.C. and A.H.M. were supported by SHINES, an Energy Frontier Research Center funded by the US Department of Energy, Office of Science, Basic Energy Sciences under Award #SC0012670. The University of Tokyo is Japan’s leading university and one of the world’s top research universities. The vast research output of some 6,000 researchers is published in the world’s top journals across the arts and sciences. Our vibrant student body of around 15,000 undergraduate and 15,000 graduate students includes over 2,000 international students. Find out more at https://www.u-tokyo.ac.jp/en/ or follow us on Twitter at @UTokyo_News_en.